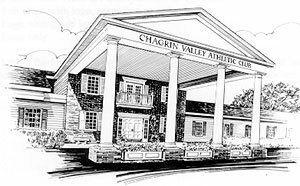 The Chagrin Valley Athletic Club in scenic Bainbridge Township offers many amenities and a country club atmosphere. CVAC is located a few miles east of Chagrin Falls and just three minutes from the Bainbridge exit of Route 422. It is easily accessible to most East Side suburbs and all of Geauga County. CVAC activities span the seasons. The Club provides over 100,000 square-feet of indoor facilities on its 30-acre site. These include a state-of-the-art fitness center with banked track, an aerobics studio, 25-meter pool and nine tennis courts. Supervised childcare offers a safe, welcoming place for little ones. Elegant dining and banquet rooms, casual members' grill, tennis lounge, and fireplaces complement the gracious atmosphere. Outdoors you will find ten tennis courts with picturesque cabanas, platform tennis, sand volley ball courts, and a 2½ acre beach lined swim lake -- the focal point for charming verandas, the gazebo and landscaped gardens. CVAC is for people who are active, appreciate quality and enjoy a friendly, vital environment. Holiday parties for the entire family, Sunday breakfast, tennis parties, Santa brunches, summer beach bashes, Easter brunch, and Club team celebrations are among the best events held in the area. This is a family club. Programs geared to children's growth and enjoyment include summer camps, swim teams, tennis leagues, playgrounds, snack bar and a children's menu in the dining rooms. At CVAC you can entertain, exercise, dine or simply unwind in complete comfort. The management team and staff members are united in their commitment to provide the finest facilities and excellent service. There is value in a membership at The Chagrin Valley Athletic Club.